If there’s one part of iOS that is not only majorly prominent but stays on the screen most of the time then that’s the Status Bar. You look at it countless times a day to check time, battery size, signals etc. Sadly iOS does not give you many options when it comes to customizing the status bar for it to better match your needs. That’s where a newly released Cydia tweak Protean comes in. 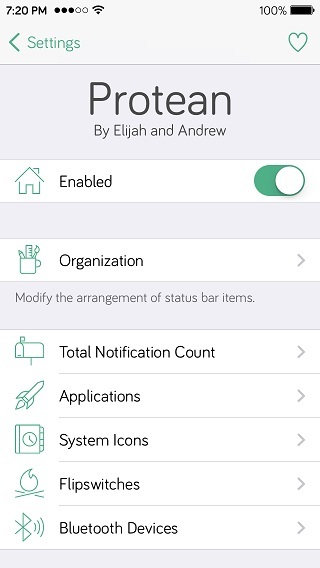 This hack allows iOS users to add new items to the status bar, remove the existing ones as well as modify them. But that’s not all as it also brings several additional features as well. Re-arranging and removing items is pretty much the basic functionality of the tweak however it is more powerful than that. You can also add useful features like flipswitches, actions for applications and other tweaks as well as a count for all the pending notifications. For example, you can make the WiFi icon launch the Vestigo tweak among other things. A nice feature of this hack allows users to quickly reply to messages by tapping on the status bar with its compatibility with most popular Quick Reply tweaks. Apart from that Protean also enables users to change the way battery percentage looks, replace the carrier name with custom text, change time format and appearance and more. You can download Protean tweak from Cydia’s BigBoss repo for $1.99. It is compatible with all devices running iOS 7 or above.